Centred around regional Italian cookery, and focussing particularly on fish and shellfish sourced from the waters of the Mediterranean and beyond, Marea has won numerous awards, and offers private dining rooms for private parties, as well as the main dining area. Type of cuisine: Regional Italian restaurant, focussing on seafood. Location: 240 Central Park South, New York, NY 10019. Phone number: +1 212 582 5100. Lunch: Monday – Friday 12 noon to 2.30pm (full lunch menu at bar). Sunday Brunch: 11.30 – 2.30pm. Dinner: Monday – Thursday 5.30 to 11pm. Friday & Saturday: 5.00 to 11.30pm. 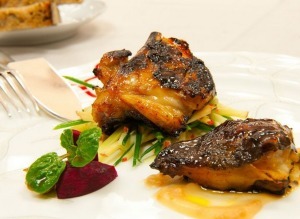 Lunch: 5 course seafood tasting menu £48 ($75) or £80 ($125) including wine. Dinner: 4 course fixed price menu at £62 ($97) recommended by Marea. Fresh, authentic regional Italian cookery, served in a comfortable and relaxed atmosphere. Depending on the time of day, either of the two tasting menus are highly recommended. If you want to god for two courses, Zoe Beckham recommends Brodetto di Pesce (Adriatic seafood soup) and Seafood Risotto. How long do you have to wait to be seated & get food? Reservation is essential at Marea. Service reasonably efficient.